I ended up going 1-2 (-0.55U) in week 2, which brings my overall record to 2-3 (+0.15U) on ML underdogs. I hit Philly on MNF, but lost the Lions and Vikings. Once I heard the news that Adrian Peterson was ruled out I knew the Vikings were going to lose to the Patriots at home. Kansas City (0-2) looked much better last week despite losing to the Broncos (24-17). 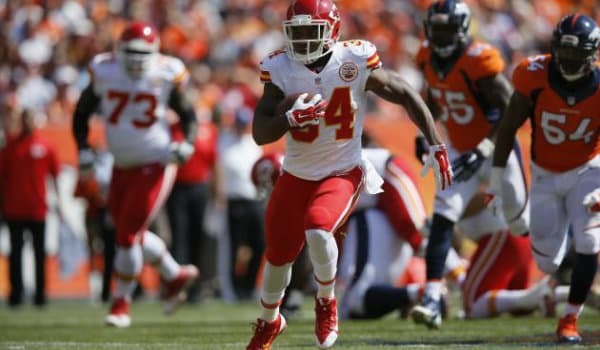 Jamaal Charles will likely be out this week, but Knile Davis could be a starting RB on most teams. Andy Reid has already stated that the game plan isn’t going to change much if Davis ends up starting. Last week Davis entered the game early after Charles left and he gained 79 yards (2 TD’s) on 22 carries. Miami (1-1) is back at home this week after losing to the Bills (29-10) in Buffalo in W2. Knowshon Moreno is out and that’ll hurt the Dolphins rushing offense (135.5 RYPG – 10th). The Chiefs defense ranks 20th or worse in points allowed, passing yards allowed and rushing yards allowed, but this is a game where they can improve greatly. Without Moreno the Dolphins are going to be forced to put more pressure on Ryan Tannehill and the pass game (189.5 PYPG – 24th). Miami is allowing 214.0 PYPG (15th), but Alex Smith should excel in this game with his short passes. The Dolphins are hurting at LB right now and they’ll have trouble covering the quick routes. It’ll be tough to win on the road, but KC is in desperate need of a win on Sunday. The New York Jets (1-1) almost beat the Packers on the road last week, but they were unable to hang on. Chicago (1-1) pulled off a miraculous 4th quarter comeback against the 49ers (28-20) after being down 17-0 early. Chicago put up 21 points in Q4 to win the game in SF. Chicago may have trouble running the football on the Jets, as the Jets have been the best in the NFL at stopping the run (52.5 RYPG). The problem on the Jets defense is in the secondary. They’ve allowed 221.5 PYPG (17th), but Chicago will put up many more yards through the air than that. The WR’s on Chicago are a bit banged up, but they all played last week and will be in the line-up again. Chicago is one of the better teams in the NFC, especially if they could improve on defense. The reason I like the Bears is because the Jets offense isn’t a huge threat to score a lot of points. Geno Smith is still not playing well in his 2nd year and Eric Decker might miss this week, which means the Jets offense is going to be extremely limited. If the Bears can match or exceed their season score average (24.0 PPG) than they’ll beat the Jets on Sunday by a TD+. These are the only two money line underdogs I’m betting on in week 3 NFL action. I think the Packers, Chargers and Broncos will be popular ML picks this weekend as well, but I really don’t like any of them. All three teams are playing on the road and in tough match-ups, which I think are best to avoid on the ML. I’m sticking with just the two bets and only need one to turn a profit.